I’ve started my own challenge “Jim Harrison in 12 books” for 2018. The best way to read again his writings and to discover the ones I’ve never read, his poetry for instance. Though I do own two books of collected poems. I’m actually enjoying Letters to Yesenin he published in 1973. Jim Harrison’s letters are a “correspondence” with Sergei Yesenin—a Russian poet who committed suicide in 1925 after writing his final poem in his own blood. This collection of poems is considered an American masterwork. In the early 1970s, Harrison was living in poverty on a hardscrabble farm, suffering from depression and having suicidal tendencies, he considered Yesenin as a “brother”. Sergueï Yesenin was a famous Soviet poet who married the famous American dancer Isadora Duncan and committed suicide at the age of 30. I’ve been reading this collection slowly, to enjoy its poems (my book is both in English and in French), and I couldn’t resist to share with you one of them. 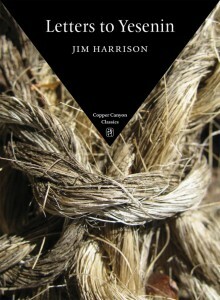 This collection was published by Copper Canyon Classics in 2007 and is still available at a tiny price. I don’t have any medals. I feel their lack of weight on my chest. Years ago I was ambitious. But now it is clear that nothing will happen. All those poems that made me soar along a foot from the ground are not so much forgotten as never read in the first place. They rolled like moons of light into a puddle and were drowned. Not even the puddle can be located now. Yet I am encouraged by the way you hung yourself, telling me that such things don’t matter. You, the fabulous poet of Mother Russia. But still, even now, school girls hold your dead heart, your poems, in their laps on hot August afternoons by the river while they wait for their boyfriends to get out of work or their lovers to return from the army, their dead pets to return to life again. To be called to supper. You have a new life on their laps and can scent their lavender scent, the cloud of hair that falls over you, feel their feet trailing in the river, or hidden in the purse walk the Neva again. Best of all you are used badly like a bouquet of lowers to make them shed their dresses in apartments. See those steam pipes running along the ceiling. The rope.